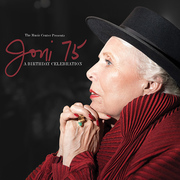 This recording is from a concert from LA's Music center back in November 7, 2018 to celebrate Joni Mitchell's 75th birthday. She had gone through some major medical problems, but has completely recovered, thank the good Lord. This album features a tribute from the plethora of singers who either sang with her back in the day or have been deeply influenced by her voice and pen. The singers are backed by an allstar cast that includes Ambrose Akinmusire/tp, Jon Cowherd/p, Jeff Haynes/perc, Marvin Sewell/g, Christopher Thomas/b, Bob Sheppard/ts-fl, Brian Blade/dr and other one-off guests. The collection of singers is impressive and reflective of Ms. Mitchell's wide palate. Diana Krall is intimate and wispy on a cocktail lounged "Amelia" while Norah Jones is deep and intimate, even evoking moods of the composer in voice during "Court and Spark." 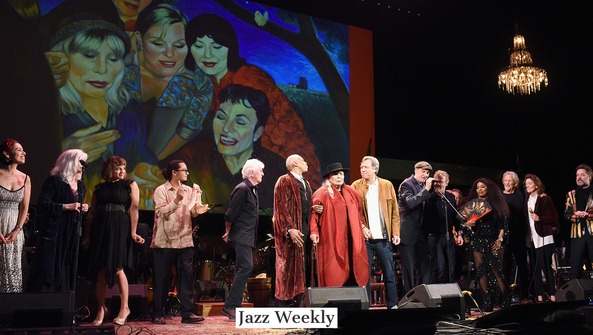 Chacka Khan gives a rich and bold "Help Me" and Los Lobos with La Marisoul, Xochi Flores & Cesar Castro go to East LA for "Dreamland" and Nashville on "Court and Spark." Akinmusire's horn is delicate along with Emmylou Harris' minstrel treatment of "The Magdalene Laundries" and works amazingly well with Mr. Mellow himself, James Taylor on a personal "Woodstock." Graham Nash gets nostalgic for "Our House" and the evening closes with a festive "Big Yellow Taxi." Let's hope that Ms. Mitchell will have the time to put out more original material of her own; this anthology is a nice tip of the hat, but hopefully not a goodbye.